Custom Air Products & Services, Inc. (CAPS), a leading commercial and industrial heating, ventilation, and air conditioning (HVAC) company, is proud to announce its newest use of 3D printing. The forward thinking used during the equipment selection process has given CAPS the ability to use a renewable resource as well as recycle what would otherwise be a waste product to reduce their cost to market and their Carbon Footprint. Custom Air Products & Services, Inc. (CAPS), a leading commercial and industrial heating, ventilation and air conditioning (HVAC) company based in Houston, Texas (US) is proud to announce the new technology being utilized for research and development by the engineering department. Within the past month, CAPS has invested in a 3D printer that utilizes Fused Filament Fabrication (FFF), or Fused Deposition Modeling (FDM), to create scale representations of their multiple equipment lines as well as customer specific unit models. The printer that they decided on is the MakerBot Z18. 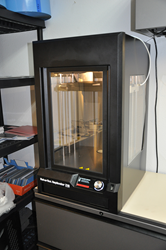 The Z18 has an internal heated chamber with a build volume of 12x12x18, making it the largest and one of the most advanced 3D printers in its class. The models they plan to produce are going to give customers a tangible, to scale representation of the equipment they are wishing to purchase as well as provide an idea of how any auxiliary components may need to be assembled on site. This visual representation will reinforce communication between customer and manufacturer and also give a better idea of the layout and access points of the unit once it is installed. Along with research and development, the models will act as a marketing tool for their sales team: the salesmen will now have the ability to show an improved projection of what the customer ordered without having to spend a single dollar on production. Along with the MakerBot z18 and Filastruder package, CAPS continues to use a laser engraver, the Gravograph LS100, to manufacture all equipment tags and phenolic tags. The engraver even has the ability to chemically etch metal tags for projects that have increased corrosive environmental concerns. In the future CAPS hopes to continue expanding its technology base with other technologies such as 3D scanning and simulation software. The use of 3D scanning can provide them the ability to scan an out-of-date component and more easily generate drawings that may no longer exist for it. Simulation software can aid in the layout of customer projects to improve fluid dynamic characteristics within a static environment. If you’d like more information about this topic, please call Shannon Falzon at 713.460.9009 or email her at shannon(dot)falzon(at)customairproducts(dot)com.